Is there anything more annoying than having to wrestle with your tangled up headphone cords? Well, our research has shown that this doesn’t happen all by itself. As usual when something goes awry, there’s a Pesterling involved. In this case it’s the Tangle Touslers that sit in our pockets, bags etc and tossle the earbud cords together. Most of the time they are relatively harmless pixies, but they do have a problem with addiction. They love to chew on sticks from the gnorp bush, to them it tastes like rainbow chocolate, and makes life feel like a really happy scene from a romantic comedy. (There is no use for humans to try it, pixie-taste buds are very different from ours, and the gnorp bush is said to taste like used band aids and unsettle the tummy when we try to chew on them). However, this stick-chewing has a side effect for the Tangle Touslers: it makes them severely cross-eyed. Needless to say, this affects both their flirting, walking and karate habits in a terrible way. (Injuiries caused by this is the number one reason for hospitalization among the Tangle Touslers). Torn between pleasure and (a lot of) pain, the Tangle Touslers constantly try to quit chewing sticks (but never quite kick the habit). They get severe withdrawal symptoms, the worst being a restless need to do something with their hands (they have at least 8 fingers on each hand). 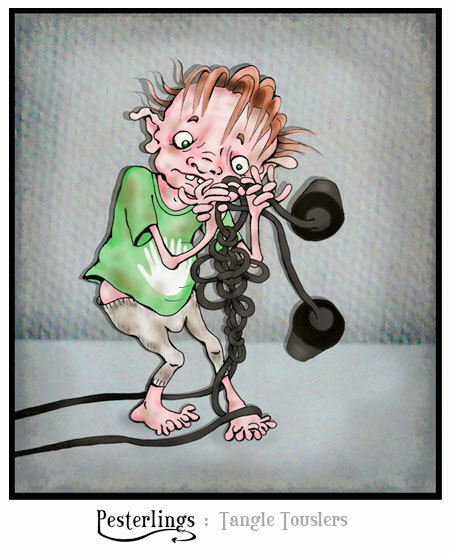 In the old days they got rid of this urge by tangling balls of yarn and fishing lines, but these days they prefer so sit in our pockets and bags and tamper with our earbud wires (they also LOVE to tangle Christmas lights).